Why Should Young People Learn to Play Bridge? Bridge is fun.. Nearly every young person who has learned to play bridge enjoys the game and the friendships developed with fellow young bridge players..
Bridge is easy to learn ... yet highly challenging. Because there are only a few absolute rules in bridge, you can begin to play quickly: all that you need is one other player to be your bridge partner and two more players to be your opponents. That, and a deck of playing cards. Still, you will never actually master playing bridge. Playing bridge is a pursuit that can last a lifetime: you can always improve your bridge score by learning additional strategies and using logic to better evaluate which strategies appear best to use at a particular time. Bridge can be competitive. At venues ranging from school to commercial bridge clubs to tournaments, bridge players try to score better than their competitors. Bridge teaches skills that are important in other life endeavors: solving problems by developing, modifying and executing a plan -- one study showed that young bridge players outscored their non-playing counterparts on standardized test scores by 23-39% in science, math and social science -- cooperating with a partner to satisfy a shared goal, complying with ethical standards of fair play, etc. 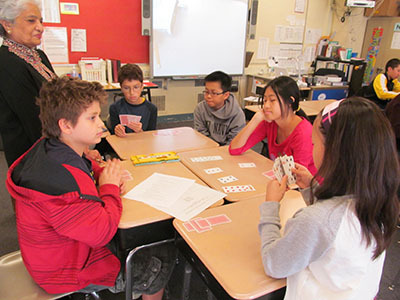 How Can I Help a School Start a Bridge Club? We have found that it is easiest to start a school bridge club if there is an adult who can act as a recruiter. Faculty members who reach out to students that the member thinks would enjoy learning to play bridge make great recruiters. Parents who will convince not only their own children, but friends of their children, to try out a bridge club can be successful recruiters, too. If you or someone you know can play this role, please contact us, and we can help with the details. Once someone has attended a school bridge club, we think the game itself will keep them interested in returning. How Can New England Youth Bridge Help Start and Sustain a Bridge Club? By supplying lesson plans and teaching aids to bridge instructors. By providing free materials such as playing cards, bidding boxes, and duplicate boards. By organizing tournament events and other competitive outlets for students to represent their schools and themselves. By providing financial assistance as needed.